1987 New York: Peter Blum Edition. 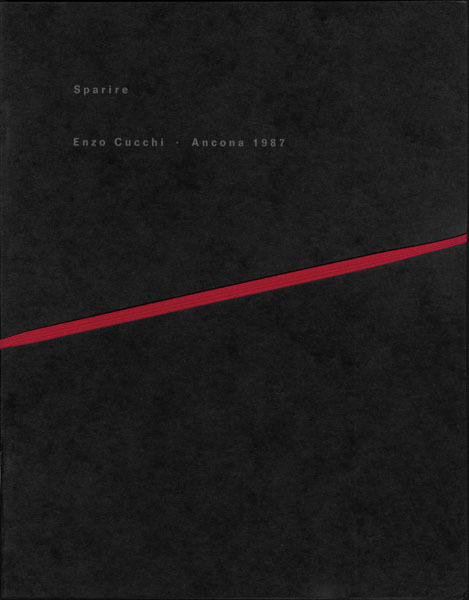 Contains a text by Enzo Cucchi, a poetic manifesto. A 2 volume set. Volume I: Original text in Italian with two reproductions of drawings by the artist. 15 pages. Volume II: Translations in English and German with an epilogue by Bice Curiger. 30 pages. Edition of 1500, 45 pages total, 2 black & white reproductions, two board bound volumes held by an elastic band.